!Romantischer Kurzurlaub oder kleine Familienspaß! Hill View Kabinen. Diese charmante, neu gebaute 1-Zimmer "Flamingo Cabin" bietet eine herrliche Aussicht auf den Hafen von Jones Ville. Direkt über dem Wasser gelegen, ist es über 800 Quadratfuß Wohnfläche. Wenn Sie auf das Deck treten, werden Sie nie mehr gehen wollen. Diese Hütte befindet sich auf 6 Hektar eines wunderschön gepflegten Punktes. Sie können von Ihrem eigenen Steg ins Wasser springen oder vielleicht möchten Sie Kajak fahren durch die Mangroven, die von Piraten benutzt wurden, oder mit dem Boot rausfahren und die Insel von der Wasserseite aus betrachten. Die sanfte Meeresbrise hält die Kabine kühl. Die Hütte hat eine offene Küche zum Essen und das Wohnzimmer ist mit TV, DVD, Internet und Kabel ausgestattet. Die Flamingo-Kabine ist geschmackvoll mit einem Kingsize-Bett und einer Klimaanlage ausgestattet, um Ihren Aufenthalt so angenehm wie möglich zu gestalten - ideal für eine kleine Familie oder ein Paar. Großes privates Vorderdeck mit einzigartigen Holzmöbeln, in denen Sie sich entspannen können. Ein perfekter Ort, um Ihren Morgen mit einem Buch oder Nachmittag und abends mit Ihrem Lieblings eiskaltes Getränk oder Kaffee zu verbringen. Der einzige Verkehr, den Sie sehen werden, ist die Boote, wie sie segeln oder vorbeifahren. Dies ist ein Wasser-Zugang nur Eigentum, aber nur wenige Minuten entfernt von wo auch immer Sie gehen möchten, es liegt in der Nähe des öffentlichen Docks. Die weniger als 1 Minute Bootsfahrt bietet einen herrlichen Blick auf das Anwesen, wie es Sie begrüßt. Wenn Sie gerne tauchen, haben wir Tauchpakete zur Verfügung. Entdecke den Tauchgang. Open Water Taucher. 1 Tauchgang 1 Schnorcheltour. Auch Tauchdienste kommen und holen Sie von Ihrem Dock für einen wunderschönen Tag zum Tauchen, Angeln, Schnorcheln oder was auch immer Wasser-Abenteuer Sie geplant haben, gibt es Schnorchelausrüstung und Angelruten für Ihren Gebrauch. Einige unserer einzigartigen lokalen Restaurants, wie Loch in der Wand, Trico's Marina ist direkt gegenüber der Hütte und auch Mcnab's Place ist nur eine Minute entfernt. Sie können auch ein lustiges neues kleines Restaurant Mangroves Paradise besuchen, das in der Creek gefunden werden kann, auch nur wenige Minuten entfernt haben wir die Gemeinde von Oak Ridge, wo Sie BJ's Hinterhof finden, wo alle Expats für einen lustigen Musik gefüllt Freitag Abend sammeln , Reef House Resort, J & D, Save Center und Hessies Lebensmittelläden sind alle auf dem Wasserweg erreichbar. Es gibt eine Menge für Sie zu genießen, wenn Sie mögen, können Sie die Kajaks nehmen und die Mangroven auf eigene Faust erkunden, können Sie das schöne kristallklare Wasser genießen, wie Sie im Bach schwimmen, können Sie schnorcheln gehen. Das Riff ist direkt vor der Hütte und wenn Sie gerne angeln, können Sie dies tun, auf hoher See, im Hafen oder auf Ihrem Deck oder Dock. Ein lokales Lebensmittelgeschäft nur Sekunden von Ihrer Kabine entfernt und andere Geschäfte nur 2 bis 3 Minuten entfernt, alles, was Sie brauchen, kann an der einen oder anderen gefunden werden. Bei der Ankunft werden Sie am Flughafen begrüßt. Auf unserem Weg zu Ihrer entspannenden Ferienhütte machen wir Halt auf Eldons Supermarkt. Wenn Sie ein Auto mieten möchten, obwohl nicht notwendig, haben wir Parkplätze gesichert. Wenn Sie sich jedoch entscheiden, kein Auto zu mieten, werde ich Sie einmal pro Woche nach Eldon bringen, wenn Sie etwas brauchen, das Sie nicht in den örtlichen Geschäften finden können oder wenn Sie zur Bank gehen müssen. Während Ihres Urlaubs in "Hill View Cabins" möchte ich Ihnen helfen, Ihre Bedürfnisse zu erfüllen und Ihnen zu helfen, sich wie zu Hause zu fühlen. Helfen Sie mir, meinen Kalender zu füllen, indem Sie den Besitzer kontaktieren, um einen besseren Preis für Ihren Urlaub zu erhalten. My girlfriend and I spent 5 days with Rosina and Sonny. Their accommodations are well appointed. We had everything and more to make our stay enjoyable. Be sure to read the guest book. It is full of things to do and when things happen in the bay. Don't wait until the last day to find out about the pool at Trico's, which by the way is a great place to eat and visit. Rosina is the best. We had a day out in the West End and were able to do all the city things and then get back to the quiet of the bay. I feel rested and rejuvenated and was very sad to go back home. PS Bring bug spray for when the winds calm. So happy you and your friend had a good and enjoyable stay at hillview, thank you for the opportunity to be your host. It was my pleasure and will always be ready to receive you in my home..
Hope to see you again on your next round. All our best to you both..
We had a fabulous time with our great friendly informative hosts Sonny and Rosina. We had everything we could possibly want or need in the Flamingo cabin. We enjoyed snorkeling, swimming, and kayaking right out in front of the cabin. We had a great day horseback riding not too far away that Rosina took us too. We enjoyed a couple of days in the motorboat provided traveling around the area and through the mangroves. We will definitely be back! Thank you for choosing my Flamingo Cabin for your relaxing vacation, we are happy you had wonderful vacation..
Hope to see you both again!! Yet there is still plenty to do. 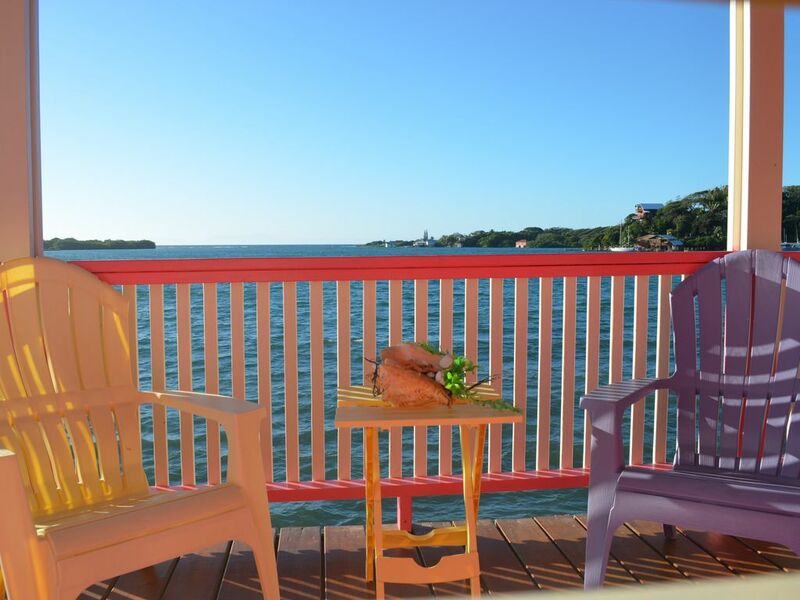 If these are your interests, this property is for you: boating, and exploring by boat, kayaking, swimming, diving, snorkeling, fishing, lounging in a hammock, star gazing, reading on a deck in the sun or shade with gentle ocean breezes. The Hole in the Wall restaurant is just a kayak away, or they will pick you up. MUST NOT MISS. Trico’s restaurant is also in the bay. There are multiple eating options in the bay next to Jonesville. It’s all very easy access by boat. Many have local entertainment afternoons frequented by expats. The owners are always near by to assist with your daily questions. They have a few very well behaved dogs and some interesting caged pets throughout their lovely yard. Our stay was enlightening, and captivating. We will never forget the sounds of the ocean waves lapping under our bed as we drifted off to sleep each night. Thank you so much Sonny and Rosina! Thank you for choosing Hillview Cabins to explore the East End.. it was our pleasure to be at your service, we are happy you enjoyed your stay and hope to have you all again.. Very comfortable place to stay with great views. Kayaking through the mangroves and to local bars was fantastic! Rosina and Sonny were super hosts. Thank you for your kind words, we are more than pleased you enjoyed your stay with us at Flamingo. Hope to have you and Jessica with us again, in the near future..
My husband and I stayed at the Flamingo cabin during Christmas and New Years. The Flamingo cabin lived up to its description and prior reviews. Rosina was always responsive in responding to inquiries regarding the property. Coordinating our arrival, even if a day late (unexpected flight delays resulted in missing connecting flights) with Rosina was easy. In fact, because of the delay in our arrival, we had decided to stay extra days if the property was available. And to our surprise and delight, it was, which allowed us another 5 lovely days on the island and in the cabin. We needed help in figuring out how to get warm and hot water in the shower, which was remediated the first morning by Sonny. Renting one of their small motor boats was the best way to enjoy the surrounding areas. It allowed us the freedom to come and go at our leisure. Availability of all the other water toys, kayaks and snorkeling gear, was fantastic. We took one of Rosina's tours out to West End and West Bay and surrounding towns for the day. That was a great way to see that more tourist part of the island. Rosina and Sonny were always helpful in answering questions and providing suggestions during our stay. The first couple of days we hadn't yet rented the motor boat, but with the ocean at our front door, we had plenty to keep us entertained. We took advantage of the two local restaurants, Hole in the Wall and Trico's, that would come pick us up for dinner and bring us back when we were done. All other places visited were friendly and fun. The local cell phone Rosina provided with pre-programmed numbers, making local calls was easy. The stop by the market on our way to the cabin was thoughtful so we could stock up on needed supplies for meals. My husband enjoyed diving at the Reef House and we both enjoyed snorkeling at various stops during our exploration in the little motor boat. It was a very relaxing holiday and I would not hesitate to stay again should we get back to Roatan and would recommend the cabins to friends and family. Thank you for giving us the opportunity of hosting you and your husband. I am very happy you both enjoyed your stay and was able to enjoy the island... thank yiu again and we hope to have you both again in the future... As a host I was very pleased with you in every way as my guests.. thank you. Additional $25per person after first 2 people Electric not included and is deducted from security at check out.